I was expecting it to be cloudy this morning....and I was right, but miracles happen and the sky cleared at around 7:30 am through to about 9:00 am when white contrails started to spoil the fun, spreading, merging and creating a milky hazy mess. Before then the sky conditions were quite good with reasonable clarity and very few clouds, but the seeing was really highly variable and for the most part pretty darn poor. However, I thought it time to try the big gun (to please Valery). This is my 250mm RCT fitted with a Lunt 35 at the back end and an internal plano-concave paralleling lens to pull the light-waves pretty much normal to the Lunt's objective fitted etalon. On the front was a full size Aries ERF. I used a 2.5x TV Powermate for a higher magnification image on the Basler acA1920-155um IMX74 sensor. Really the seeing conditions were JUST about manageable, at least for one reasonable image of the active region. Most of my data ended up in the bin. Images were captured using Genika Astro, stacked with AS!3 and deconvoluted using ImPPG with final finessing and colouring using PixInsight. 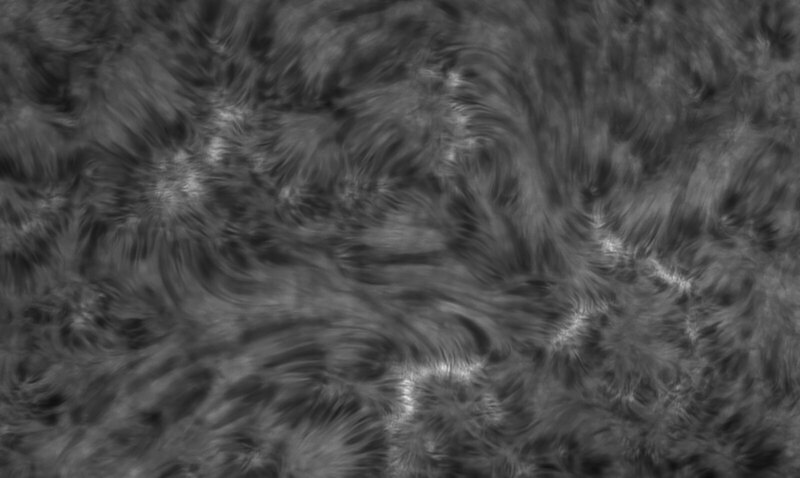 The SER files were captured as 10s bursts and I stacked 1% of the 1650 frames contained therein. I should have made the final images a bit brighter as they can look a little dark (depending on which machine I look at them with). Would love to see how you fitted that Lunt 35mm to the RC! Hi, I did post an image of the set up. I'll try to find the reference. Ahh yes, I remember that now. I always wondered what the components were. And that Lunt is just inserted right into another scope, kind of like a PST stage I mod? That cell that holds the scope is super interesting. I imagine custom machined? Forgive my non-stop questions, I'm trying to piece together a potential 8 inch HA scope setup, using a C8 and a crayford focuser on the back and I'm trying to find better options than just using a PST etalon, such as the 35mm Lunt option, or a SolarMax II 40mm cell in some way. Not sure yet. No probs with the questions. Just thought I'd point out that the Lunt is not simply connected to the rear of the RCT. There has to be a negative focus lens (correction lens) in place ahead of the Lunt in order to diverge the light cone from the donor scope such that is enters the Lunt etalon substantially normal to it. The focal ratio and position of this lens will depend on the donor scope. The 'cell' is indeed custom made, including the extension element on the front which carries the correction lens. Great results for such a close-up image, Stu ! I also like your "soft" processing of the image, without too much hard contrast. Your big gun is definitely working: I hope you will have excellent seeing conditions in the future to use it more. Well done Stu you really are getting some good results. 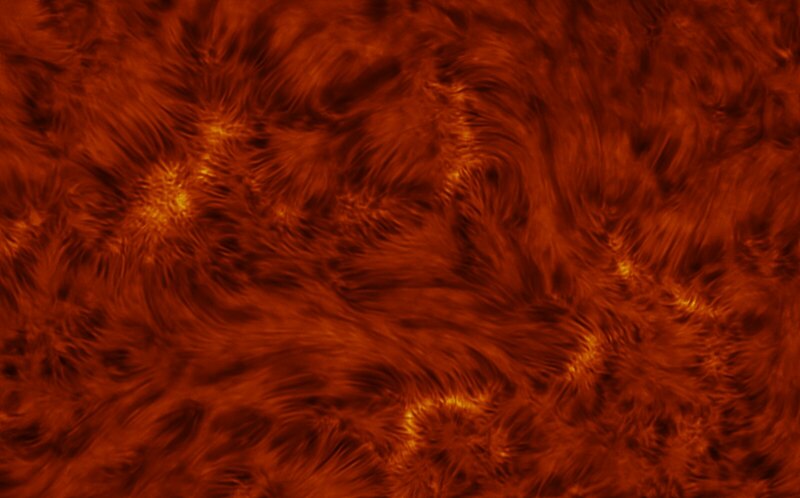 Fantastic resolution and very good processing. The Lunt 35 is a really fine scope. A very nice big gun setup, at least you have tried your 250mm ERF, I have not yet used my 265mm Aries ERF for my 250mm Maksutov. Bad weather and remodelation have not let me. Many thanks, everyone. I really appreciate your comments. Eric, I hope you get to set up yours sometime soon. Thanks, Alexandra. I agree with you, but it really took quite some effort to squeeze out every drop of data with minimal noise. It's so difficult when the seeing conditions don't cooperate.